New York Film Academy is pleased to announce our National Tour for 2019. Come meet us as we travel the country conducting Auditions, Portfolio Reviews (for our degree programs, 1 & 2 Year Conservatory, and workshops) and learn more about our programs at our Information Sessions. Qualified applicants may be considered for the opportunity to receive a scholarship or talent-based discount on NYFA tuition. RSVP to secure your spot today! Once you RSVP, one of our admissions representatives will contact you to answer any questions you may have. Acting Audition Requirements: Please prepare two contemporary, contrasting 60-90 second monologues from a published contemporary English language play or screenplay. Musical Theatre Audition Requirements: Please prepare two contrasting musical theatre songs with musical accompaniment on a USB, personal musical player (e.g. iPhone), or CD and one 60-90 second monologue from a published contemporary English language play or screenplay. Portfolio Reviews for Degree Programs: Creative samples can be accepted in various stages of development, or as completed work. Examples of work can range from drawings, conceptual illustrations, short films, poetry, short stories, storyboards, designs, photographs, three-dimensional models, or digitally generated images. Students may choose to submit a typed screenplay or short story (10 page maximum). ***Your admission and/or Talent Based Discount will be determined upon the final review of your audition/portfolio. Auditions are required for acceptance for long-term programs in Acting for Film and Musical Theatre. Talent Based Discounts are for long-term Acting and Musical Theatre Programs. Portfolio Reviews are for long-term programs in Filmmaking, Documentary Filmmaking, Media Studies, Photography, Screenwriting, Cinematography, Screenwriting, Graphic Design, 3D Animation & VFX, and Game Design. Portfolio Reviews for Talent Based Discounts are for Degree Programs only. Programs 1-year or longer are considered long-term programs. 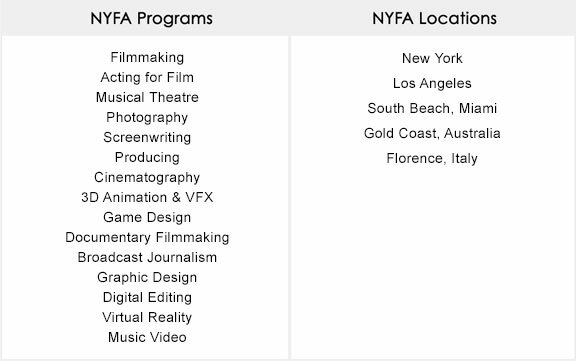 To audition or to have your portfolio reviewed for the New York Film Academy, individuals must submit a program application. Applications can be submitted online or you can bring the application form to the audition. There is a $65 (US dollars) application fee required. All discounts awarded will be based on talent. Over the past 20 years, the New York Film Academy has built a reputation as one of the premier hands-on film and acting schools in the world. With our innovative hands-on approach to teaching, students find themselves completely immersed in their course of study, surrounded by award-winning faculty and working with state-of-the-art equipment and facilities. The project-based curriculum is designed to reflect a real-world environment while encouraging students to explore their own creativity and passions.